GAY BYRNE IS one busy man. Not only was he on the Late Late on Friday, but his latest TV show The Meaning of Life is back on our screens AND he has a new book out. We decided it was high time to check in with Uncle Gaybo once again and celebrate what he’s done for Irish culture through the years. Remember this? It takes us back. Mostly to being late for school. And yes, it was THE talk show of Ireland. So much so that the country’s biggest superstar, Bono, presented him with a Harley Davidson motorcycle on his last show. Nice. Ah, the Rose of Tralee. You may like it, you may loathe it. But you always watch it. Gay was the original host and helped cement the show as a must-see event in the Irish calendar. You might have forgotten this one. But, in a simpler time, there was a call for the best housewives in the land to show their stuff in order to win the ultimate prize – a kiss from Gaybo. Oh and a new cooker. Otherwise known as The Meaning of Life. Gay gets celebrities to divulge their deepest, darkest thoughts on life and death. Quite the eye-opener! Who Wants to be a Millionaire? We do, please. It was simple: Ask the Audience, go 50/50, or Phone a Friend. 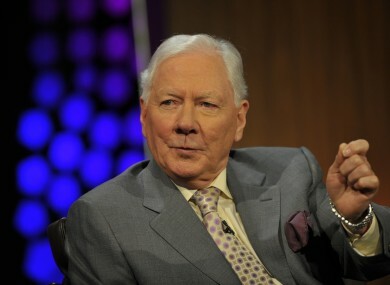 If you played it right, Gay Byrne could make it happen for you. Gaybo came back to our screens in 2011 with this show. Short-lived but sweet, Gaybo experimented with the “This is Your Life” format in this show that aired in 2005. If you want to hear the greatest showbiz stories from the man who has heard them all, you can catch Gaybo in a venue near you. His one-man show is selling out all over the country! Go on, ya good thing! He has fully embraced the role of Chairperson of the Road Safety Authority, even doing a two-part series with TV3 to highlight the tragedies on Irish roads. He wrote his autobiography “Time of My Life” in 1987 and he has just released “The Meaning of Life” where he reflects on the show’s most memorable insights to the big questions and how it affected him. There aren’t many presenters who could keep a straight face while this was going on. And then congratulate them on a job well done! We’d love to know what he was thinking. Or what they were thinking, as a matter of fact. The Late Late never shied away from a bit of controversy. Whether it was condoms, abortion, divorce, homosexuality, no subject was off limits for Gaybo. He outraged many but he educated more. We salute you, sir. We can’t prove it, but we think Gaybo might be single-handedly responsible for the rise in Christmas Jumper popularity. He started the tradition on the Toy Show and it remains to this day! We thought we’d just let this one speak for itself. What a legend. Have we left anything out? Email “15 Shades of Gay... a look back at Uncle Gaybo through the years ”. Feedback on “15 Shades of Gay... a look back at Uncle Gaybo through the years ”.